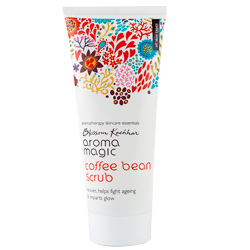 Aroma Magic Coffee Bean Scrub - Revives, Fight Ageing & Imparts Glow, Exfoliate, Deep Clean & Improve Circulation. Revives, helps fight ageing and imparts glow. 100% free of harsh chemicals, alcohol, parabens, phthalates, sulphates, artificial colouring and fragrance. As a super innovative all-natural scrub formula made of green coffee bean extract, honey and organic coffee arabica powder, exfoliate, deep clean and improve circulation. Their anti oxidant quality regenerates new skin cells, fights free radicals caused by pollution and the harsh sun which causes wrinkles, fine lines and age spots associated with ageing. Mild aromatherapy blend of lemon grass, grapefruit and juniper berry essential oils detoxifies and rebalances the skin. The sublime combination of olive oil & shea butter provides moisture, softness, smoothness and a great glow. Aqua, Vegetable Glycerine, Organic Butyrospermum Parkii, Organic Coffee Arabica Seed Powder, Olea Europea Fruit Oil, Green Coffee Bean Extract, Mel Extract, Cymbopogon Schoenanthus Essential Oil, Citrus Grandis Essential Oil, Juniper Berry Essential Oil, Food Grade Colour.